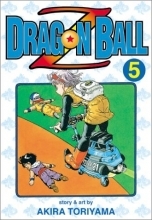 Using the ancient Namek spaceship, a last-ditch party of astronauts  Bulma, Gohan, and Kuririn  set off to Planet Namek. But upon landing on the original world of the Dragon Balls, the space explorers' jubilation is short-lived: Vegeta arrives minutes later. Worse still, the greatest despot in the universe, Emperor Freezer, has already invaded!